Diggin' to China: "Don't Bring a Gun to A Snowball Fight!" 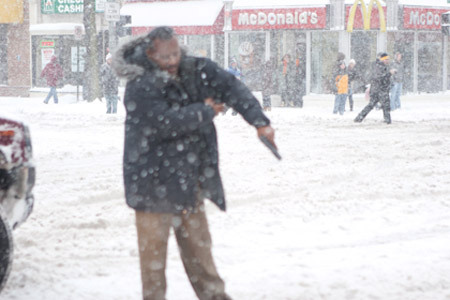 "Don't Bring a Gun to A Snowball Fight!" "Yes I did. Because I got hit with snowballs." A Twitter and Facebook organized neighborhood snowball fight took a turn for the surreally worse when Detective Bailer , I mean an as yet unnamed of the DC Police force pulled his police issued fire arm and threatened people at an impromptu snowball fight during the blizzard blanketing the east coast. Apparently a snowball hit his vehicle- his personal vehicle - as he was off duty at the time so he let from his truck pulled his gun on the crowd and started threatening people. Thankfully no one was shot and killed buy this nutjob and even more thankfully it was all caught on camera. Labels: abuse, Cops, corruption, police officer, Politics, Washingto D.C.